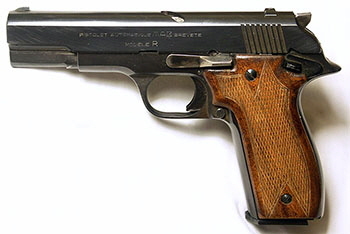 The Manufacture d’Armes de Bayonne (MAB) began making their Model R series of pistols in 1950. The new design was not a radical departure from their previous pistols, but it was not well received. 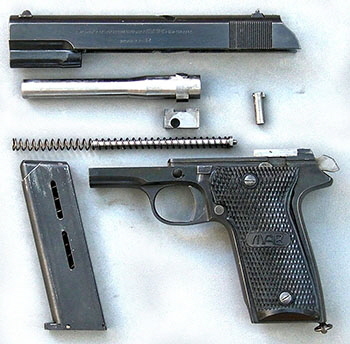 The major differences from the company’s earlier pistols were an external hammer, the elimination of the grip safety, and a mechanism to hold the slide open when the last round was fired and close it upon the insertion of a fresh magazine. 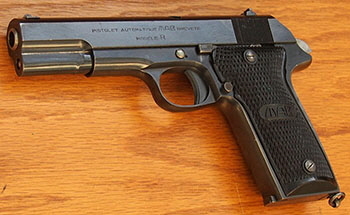 Due to a lack of demand, factory output of the R-series pistols was negligible compared to that of their traditional products, the Models A, C, and D. Production of the centerfire Model R pistols ended in 1963 with only a few thousand pistols made, though the .22 caliber rimfire version continued into 1965. However, sometime in this period the company began to experiment with a rotary barrel mechanism for the 9 mm pistol. Rotary barrels are reasonably well represented in the history of automatic pistols, beginning with the 1907 Steyr-Roth and the 1907 Savage, followed by the 1912 Steyr-Hahn, by Josef Nickl’s various rotary barrel designs which culminated in the Czech vz-24, and by the Mexican Obregon. 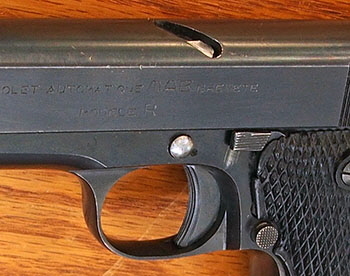 The MAB design most closely resembles that of the Czech vz-24 or the Mexican Obregon. Initially, MAB simply took the existing Model-R frame in 9mm (which I shall refer to as the R-9) and designed a new slide with the recoil spring beneath a rotating barrel (instead of around the barrel, as on the R-9). They continued the existing serial number sequence and used the Model R roll stamp on the slide. The highest serial number I have recorded for a model R-9 is 1441, and the serial number for the rotary barrel prototype shown here (which I refer to as the R-9X) is 1587. I have been contacted by the owner of SN 1586, which also has the rotary barrel. Daryl Magee indicates that examples with a rotating barrel are known between serials 1500 and 1800. The R-9X barrel has a helical lug on top that moves in a slot cut into the top of the slide. A transverse lug on the bottom of the barrel turns in a slot cut into a steel block which is fixed in the frame by the large pin above the trigger. This is the opposite of the configuration of the Czech vz-24, where the helical lug is on the bottom of the barrel, but otherwise the functionality is nearly identical. The action is regarded as a retarded or delayed blowback mechanism, rather than a true locked breech. The force of the rotating bullet keeps the action closed until the bullet exits the barrel. Eventually the frame itself was redesigned. 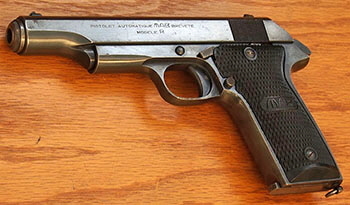 The manual safety was moved to the rear, the single-action lockwork was moved from the left to the right side of the gun, and a 1911-style slide release lever was installed. The grip tang was extended and the backstrap was given a more ergonomic curve. At this point the gun looks exactly like what later became the MAB P-8, except the gun has a slot cut in the top of the slide and is still marked as a Model R. A gun like this, from the collection of James Rankin, can be seen in the Standard Catalog of Firearms under “Bayonne, Manufacture d’Armes,” labeled as the “MAB Model R PARA Experimental.” Finally, the grip itself was widened to accommodate a double-stack 15-shot magazine. These final prototypes still have the curved grip-strap of the P-8, but retain the slot in the top of the slide and continue to be marked as a Model R.
Manufacture of the P-8 and P-15 pistols began in 1966. P-8 production only lasted through 1968, but the P-15 continued to be manufactured by MAB or successor companies until 1992. Bastié, Jean-Pierre & Casanova, Daniel. Les Pistolets MAB. Crépin-Leblond et Cie: 2015. Huon, Jean. Les Pistolets Automatiques Français. Histoire & Collections, Paris: 1995. Magee, Darel. “Big Bore Blow-Back Auto Pistols.” Gun Collector’s Digest. Digest Books, Northfield, Illinois: 1974. Schwing, Ned. 2005 Standard Catalog of Firearms. Krause Publications, Iola, WI: 2004.